For several weeks I have been playing around with the 12 pieces of T-Fal cookware I was sent as one of 50 bloggers giving away a set. 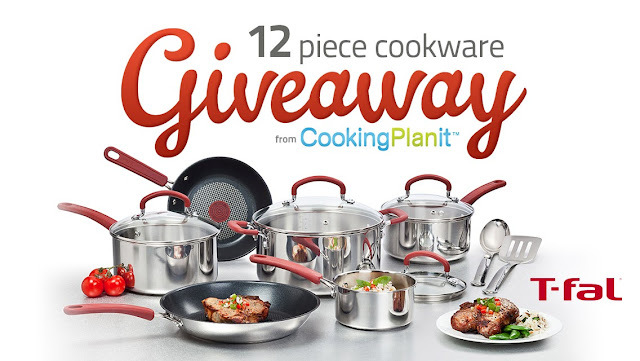 The giveaway is from Cooking Planit, an app for computer, iPhone, or iPad. Cooking Planit streamlines the process of cooking a meal by giving the user step by step directions that ensure all dishes being prepared are ready at the same time. To get the free app go to this link: http://www.cookingplanit.com . (It’s the one common thing that all 50 bloggers will require in their individual giveaways.) My giveaway will begin sometime during the day of August 28, so be sure to come back on Wednesday to enter. Click on the banner above for information on entering the other participating blogger’s contests. Below are my observations after using the cookware. The cookware has got a handsome look; it’s made of stainless steel with red silicone handles. The Dutch oven and three other varied sized sauce pans have internal measuring marks and lids. The lids are glass so it’s easy to see what is going on in the pot, and the lids have a tiny little steam vent. The large skillet and smaller sauté pan have a nonstick and scratch resistant surface. Both the skillet and the sauté pan have a red thermo spot which indicates when the pan surface is preheated. The set is dishwasher safe, but I found it was a breeze to clean them just by dunking them in soapy water and giving them a rinse. The pans are oven safe up to 450 degrees and the lids up to 350 degrees. That makes the Dutch oven the perfect vehicle for stews or that ubiquitous “no kneed” bread recipe. The large skillet would be great for finishing a frittata off in the oven especially since the silicone handles won’t burn hands. One feature I really enjoyed was how fast and evenly each pan heated up which made me less stressful when I was in a rush. This set, worth $129, is something a busy mom would enjoy as well as a passionate gourmet cook. Below are some photos and links to recent recipes when I enjoyed using this great cookware. A perfectly cooked Spinach Melt Sandwich via the skillet thanks to the Thermo Spot and non stick surface. Get this yummy recipe from http://yatesyummies.blogspot.com/2013/08/an-upcoming-t-fal-cookware-giveaway.html and see where I got a bit of help from the Cooking Planit app! This looks amazing! love those greeneries and fresh veggies included in this one of yummy recipes here. Thanks for sharing. I'd love to share this to my pinterest board. Thanks for your comment! I'm glad you enjoyed looking at the photos and I hope you'll follow the links and try cooking them. I will look for you on Pinterest and follow your boards - Best wishes!